BBC NEWS | Middle East | US policy: Fresh start or more of the same? US policy: Fresh start or more of the same? The problems the US has had in occupying Iraq have left the world wondering whether the assertive foreign policy of the Bush administration has reached its limits. A year ago, just after the invasion, lists were being drawn up of the next countries to be dealt with - Iran and North Korea being at the top. They are, after all, the other members of the "axis of evil" named by President George W Bush. Yet a year on, Iran is still pursuing a policy of developing its own uranium enrichment programme and North Korea has certainly not ended its own nuclear ambitions. In both cases, the US has pursued diplomacy not war as a means of applying pressure. Perhaps Libya will be the example to be followed in future. Libya gave up its weapons development and has been rewarded. So does the experience of Iraq mean that America got its fingers burned and will be unwilling to put them near the fire again? Will there be more multilateralism if Mr Bush wins a second term in November? Or is Washington just keeping its powder dry and does not really care about the fractures in the Western alliance and its unpopularity in the Islamic world? Frank Gaffney, one of the spokesmen for the neo-conservative view which seeks to have the world reshaped, stands by the doctrine: "My guess is that if we see Iraq stabilised, you will see a greater confidence about US policy. "If we come a cropper, it could result in a change of government in the United States. But any change in policy will augur badly for the United States and the international community." He accepts, though, that Iraq, to say the least, has not been an unqualified success. 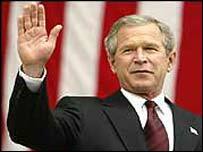 "The liberation of Iraq in some respects succeeded beyond our wildest imaginings," he told News Online. "The liberation took place with relatively trivial casualties and damage, bad as it was for those concerned. "But it is certainly an incomplete success and whether it turns into something far short of success or even a failure depends on whether things go badly." Mr Gaffney, President of the Center for Security Policy in Washington, was critical of the slow progress to Iraqi self-rule. "It is regrettable that we did not in the five years since 1998 build a government-in-waiting," he said. "We turned ourselves into an occupation force and a lot of water has flowed over the dam as a result. Now the people of Iraq have an opportunity to build a new future." A contrary view came from Lawrence Freedman, Professor of War Studies at King's College, London. "Iraq might not yet be failure, but the opportunity will be hard to take up. It is up the Iraqis to make something of the mess they have been bequeathed. "There was lack of preparation, resistance was underestimated and there was a lack of capacity to meet it. "As for the ambitions that Washington had for Iraq to be a democratic beacon in the Middle East, clearly it is not. It is at risk of being a source of instability if the wrong people get a base there." Professor Freedman thinks that the United States is already more cautious in foreign policy. "It is so over Iran and North Korea. The United States has been undermined by what happened in Iraq. "It cannot be as swaggering as before. It needs allies and support. Hubris has a lot to answer for. Its diplomacy has been arrogant and incompetent, a dangerous combination." He went on: "US moral authority internationally is in the worst state ever. One can state that. As the US is the largest power, this is extremely unfortunate. "It means that the United States might not do things which it ought to do. It might withdraw into a shell and say that nobody likes us. "We want something in between." It is noticeable that so many of America's friends are speaking like this. Another is Lord Powell, who as Charles Powell was Margaret Thatcher's right-hand man during the Reagan years. In an article for the Financial Times he wrote: "The first step is to recognise quite how bad transatlantic relations are. "Europeans view the US as a unilateralist loudmouth ready to ride roughshod over international law. For most Americans, most Europeans are weedy and pusillanimous, soft on terrorism and rogue states." He called for the appointment of a presidential envoy to restore relations. "The appointment of someone with the calibre of Colin Powell as a presidential envoy to restore transatlantic relations in a second Bush administration would be the most persuasive evidence of America's intention to make a fresh start." The Europeans had their role to play as well, he said, but when people like Charles Powell speak of how bad things are, they must be bad.